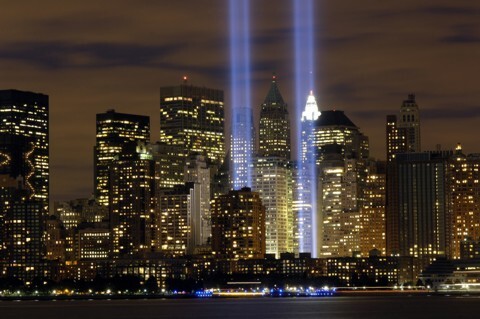 A Pius Geek: Looking back on 9/11, ten years later. When I first walked into English class at St. John's University, it was a little before 9am. The professor was one Dr. Robert Forman. He was always entertaining, and there's something about him that tells you he cares that you learn something in his class. The first person I saw was my classmate Tony. I said hello, and he asked, "Did you hear something about a plane running into the World Trade Center?" And I laughed. All I could think is what idiot could have missed noticing that there were two rather large buttersticks in the sky right in front of him? I explained that to Tony. He agreed, and I gave it no thought at all for the rest of the 90-minute class. I went from one class to another -- Christian Spirituality and Mysticism, 10:40am, taught by a priest whose name I can't recall right this moment. He was not only pleasant, but happy. He was also very Italian, and joked about it often. When I arrived, the professor wasn't there, and someone came into class saying that classes were canceled. I went to the nearest inter-university phone and called my father -- who was an Assistant Dean at SJU. I called, told him my class was cancelled, and how are you doing? Walking from one building to the other required that I cross from Marillac Hall, past Council and Newman Halls -- a narrow corridor outside that was as well directed as any sidewalk intersection without a traffic stop. Ironically, it was afforded the best view of the Manhattan skyline that the University had to offer, without going into the university library --- SJU is, for the record, the highest point in Queens. But, I didn't stop for a second. My pace was quick and even, mainly because there were so few people in my way -- for once. Though there was one odd bit of business going on at the time, something I found odd even before I made it to my father's office: there were clusters of people with their cell phones out. After the third such group, I felt like I was in a scene from Alfred Hitchcock's The Birds. 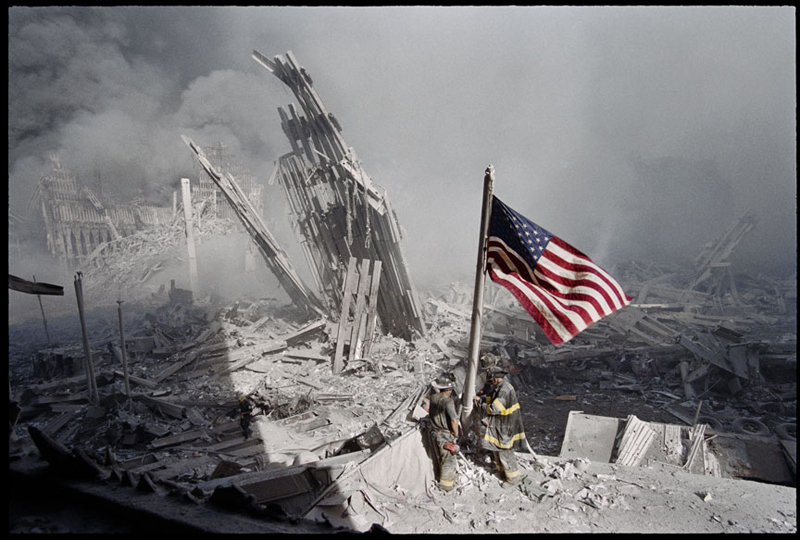 I walked into my father's office at the other side of the library, and before I could even open my mouth, my father said, "Planes have crashed into the Pentagon and the World Trade Center. The twin towers are gone, and the Pentagon is burning." And I remember this quite clearly, because I had a little red notebook with me at the time ... my first thought was "Didn't Tom Clancy already write this novel?" My father suggested I go to the library, and observe the skyline. by the time I got there, the library was locked. So I walked back to the terrace I had just gone over. Instead of a skyline, there were ground based storm clouds running from south to north. I stood there for an unknown length of time, completely focused on it. I didn't even notice my acquaintance Andy walk up next to me. "I can't wrap my mind around it," he said. "I can't believe they're gone." If I replied to him, I don't remember. Much of what I had from that day I have preserved in my little red notebook -- a habitual writer's thing, a notebook. I thought that Fr. Andrew Greeley was writing a column right that moment ... and he was, one that focused on the calmness of New Yorkers evacuating into New Jersey. I thought that I had to rewrite my thriller novels, because one of them was a CIA assassin, and at that moment, I knew what she was doing at that exact moment in history. I also knew that Osama bin Laden was a dead man walking. One way or another, someone was going to hunt him down, and shoot him. Probably after he was hurt ... a lot. On the way home, we had to drive around Union Turnpike, since the local park was a great site for emergency vehicles to assemble. My family could only watch television that day because we had cable. We must have watched the towers fall a few dozen times by the end of the day. There were theories that Camp David might be a target, because the Camp David accords had an anniversary that day, or soon. And there was supposedly a car bomb outside of the state department. The initial estimated dead: 55,000. By 1pm, it had become 10,000. At 6pm that evening, I was amused by a report.... four hours after the attacks in New York, parts of Kabul were burning. The Taliban were under attack. I wondered if (1) Mossad moved really fast, or (2), the dissidents wanted to get on our good side. I would later learn that a leader of the Northern Alliance had been assassinated by the Taliban several days before, and that was their reprisal. By that evening, there were 200 firemen missing, and 70 cops also MIA. We had learned that there were people who jumped out of the towers rather than burn. There was also no looting ... because this is not Los Angeles. This is New York, where even the criminals were nice enough (or smart enough) to stay home. There was a seven hour wait to give blood, until people were turned away. We had shocking news: The NY Times said something nice about "the nazi," Mayor Rudy Guiliani, calling him Churchill in a baseball cap. NY Governor Pataki had come down. He thanked a fireman in critical condition for his service, and the fireman said, "Well, what do you expect?" And by night, there were so many who showed up with lit candles, the city looked like it was on fire. By January 20, 2002, we had a count around 2,900 dead. Ann Coulter made a statement that many were pissed off about: "We should invade their countries, kill their leaders and convert them to Christianity." A quote which could be offensive if not for two things .... one: if you ever get a chance to read that article, you will notice that it was about mostly about a friend of hers, Barbara Olsen .... she was on a plane that flew into the Pentagon. So, she was annoyed. When asked about it later, she told Fox news democrat Alan Colmes "We better convert them to something, even if it's what you call 'real Islam.' " Which, frankly, converting the 10% of the muslim world that hate us (about 120 million, give or take) to something other than a sharia-variant would be a good idea. “We need to kill them. We need to find them and to kill them. We kill them. Then we find out who sent them and we kill them too. You kill the people who did it. You kill the people who planned it. Then you kill everyone who is happy about it…"
I think at the end of the day, more people would rather have Ann Coulter's solution of converting people who want to kill us, even if it's to generic, Atlantic-avenue Islam; it would be a better idea than my general feelings on the matter. But, frankly, I don't think it's a matter of religion. Americans have protests and near riots over any civilian caught in a war zone. Instead, in the Muslim world (which included parts of New Jersey), there were people who had parties over 9-11; if someone feels happy about killing civilians, there is something wrong with that person as a human being. That person is about the same level as the average serial killer. The cops and firemen who were there are being locked out of any 9/11 memorial. They've locked out any and all priests from even showing up. The cross forged from I-beams of the tower are being threatened by atheists with nothing better to do. The unions who showed up in force to clear the rubble of the towers have started to turn it into a political freakshow. Rye play land in New York has a "Muslim Day," and it turns into a riot because they banned all headgear from roller coasters. This includes a a hijab -- something about not wanting the woman strangled or decapitated. There are no replacement buildings yet. And, damnit, I want a WTC with a missile battery. Everyone likes to say never forget. I hope this has made some people remember.